Guess which country in the world has the greatest oil reserves? If you said Saudi Arabia, you’d be close, but number one is actually Venezuela, with 17.7% of the world’s proved oil reserves. Saudi Arabia is second, with 15.8%. Canada, with 10.3% of the world’s proved reserves (about 174 billion barrels), comes in third. Speaking of North America, here’s an interesting fact about oil reserves in the United States. At the end of 2003, the US had 29.4 billion barrels of proved reserves. 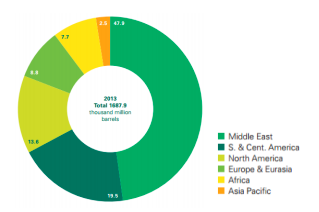 By the end of 2013, that number had grown to 44.2 billion barrels. 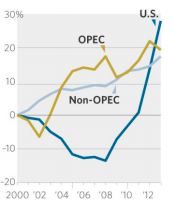 That’s a 50% increase in 10 years, primarily due to advancements in shale oil technology.